It’s difficult to feel at ease when walking around Ban Kok Sa-Nga, in Thailand’s northeast province of Khon Kaen. Despite appearances, this quiet little village is the stuff of nightmares and bad Samuel L. Jackson movie plots. 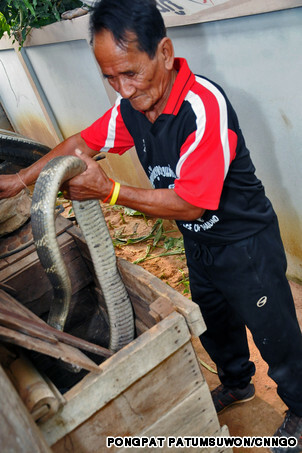 Better known among tourists as simply “The Cobra Village,” almost all of Ban Kok Sa-Nga’s 140 or so homes have at least one pet snake living in a wooden box outside, from massive king cobras and deadly monocled cobras to less dangerous species like pythons and copperheaded racers. 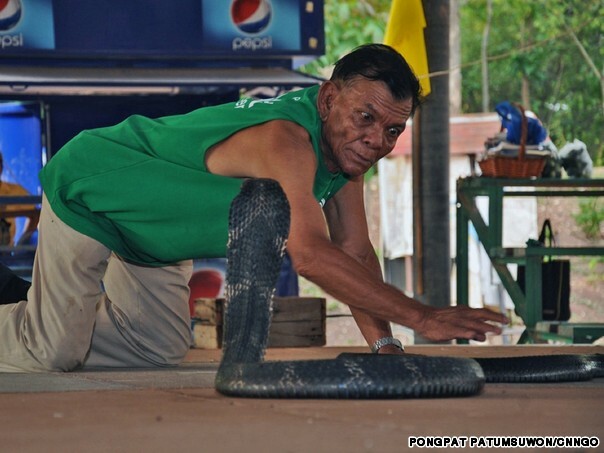 Cobra shows in Thailand are now as ubiquitous as bull fights in Mexico. 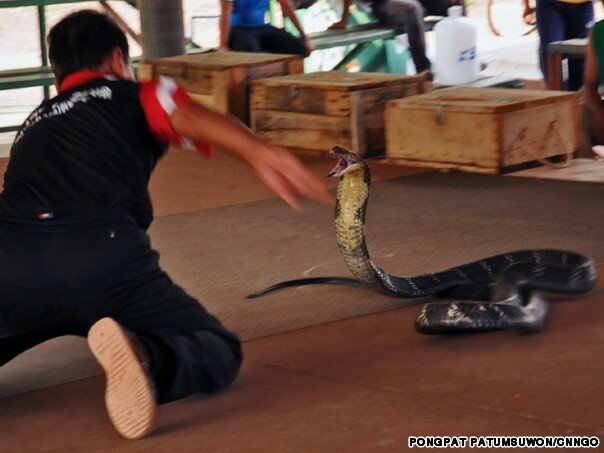 And there’s nothing particularly remarkable about Ban Kok Sa-Nga’s version, with its bad sound system and exaggerated gasps of disbelief from the announcer as the showmen dodge the venomous fangs of the king cobras. But walking around the village, away from the show grounds, what’s intriguing is how eerily comfortable all its residents are living with animals that give most people bad dreams. “I’ve been bit 21 times,” he says with a tinge of pride in his voice, holding up his battered hands, which are absent a few digits. An ironic statement coming from a man who moments earlier could be seen, center stage, forcefully kicking a king cobra’s head to the floor in a man vs. snake ‘boxing’ match. 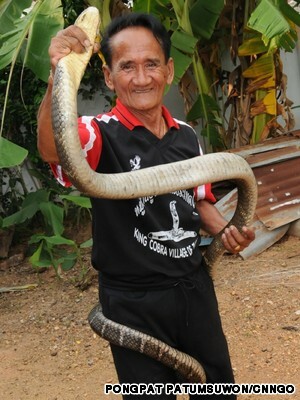 But Bualee’s adoration for his snakes is evident when we leave the show grounds and arrive at his house, one of the largest and newest in the village. Ban Kok Sa-Nga’s residents take turns helping out at the show grounds, though they don’t make much money given admission is donation-based. 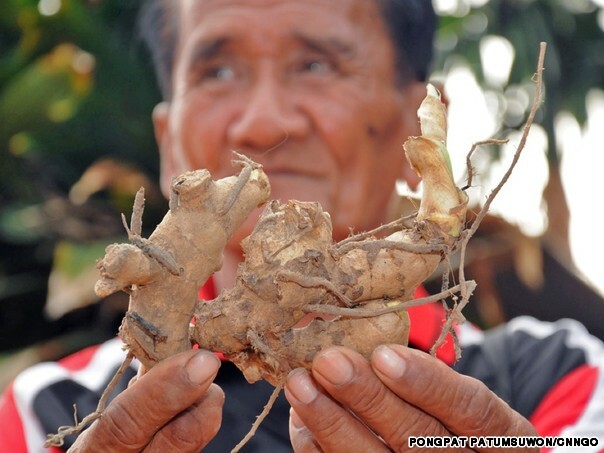 Bualee says the village’s main source of cash is still locally grown herbs, sold at the cobra show market and around Khon Kaen province. 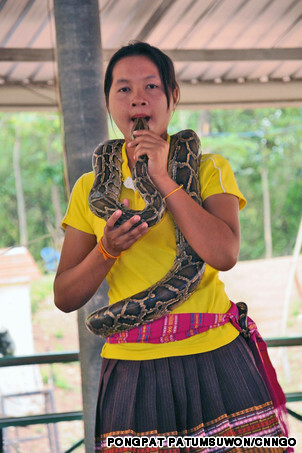 The herb Ban Kok Sa-Nga is most famous for is “wan paya ngoo,” which Bualee says they use when the snakes’ fangs manage to sink into some skin. 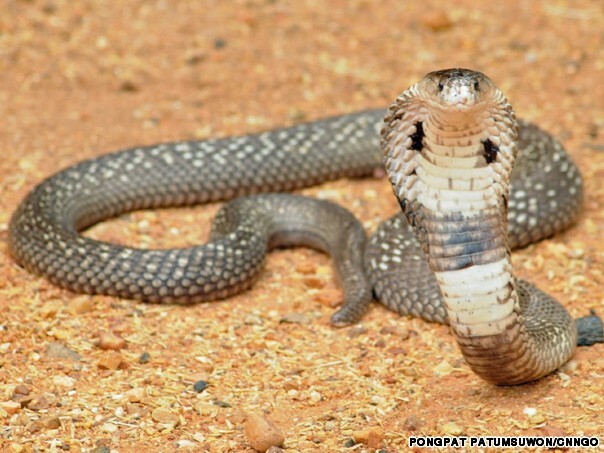 A report on the U.S. National Library of Medicine website confirms wan paya ngoo is indeed effective against cobra venom, linking it to an isolated molecule that is potent enough to protect cellular proteins from the venom’s degradative enzymes. Though the feeling that a cobra, hood flaring, could pop out of a bush at any minute prevails, in reality the village keeps its snakes locked up securely. Unless you ask a local to see his/her personal stash, chances are the only snakes you’ll encounter are the ones in the show. The village doesn’t just breed snakes. Bualee says they buy them too, with people from other Isaan provinces as far away as Sisaket bringing them to Ban Kok Sa-Nga. 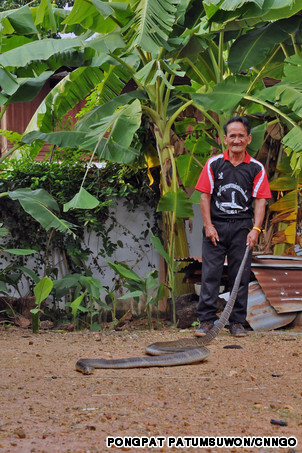 For each snake, he says they’ll pay 5,000 to 6,000 baht. And selling them is out of the question. So if they’re not making money off of them, why buy them?